On Thursday, South Carolina state prosecutors revealed in court documents that they will seek the death penalty for Dylann Roof, the 21-year-old charged with murdering nine black Charleston churchgoers on June 17. Roof has been accused of fatally shooting members of a Bible study group at Emanuel African Methodist Episcopal (AME) Church. It was later discovered that he held white supremacist views, classifying the massacre as racially motivated. Ninth Judicial Circuit Solicitor Scarlett Wilson said in a news conference Thursday: "This was the ultimate crime, and justice from our state calls for the ultimate punishment." 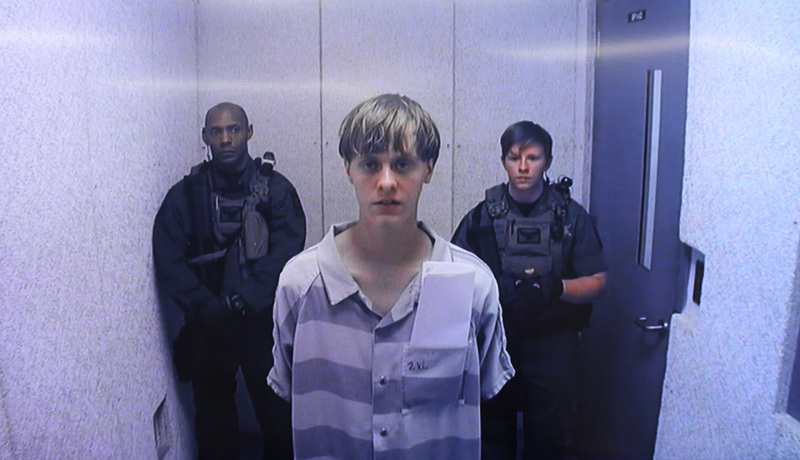 Roof was indicted twice for the murders, in state and federal court. Each case holds the possibility for the death penalty, but federal prosecutors have not publicly said whether or not they'll seek that sentence. According to The New York Times, court documents stated that prosecutors wanted the death penalty because more than two people were killed, and others' lives were put at risk by the shooting. South Carolina law allows a death sentence in cases with aggravated factors, including multiple murders at one time. At trial, state prosecutors plan to show evidence of Roof's mental state, prior criminal record, and lack of remorse for the murders, according to The New York Times. The possibility of receiving a death sentence could affect how Roof pleads in the state's case against him. According to Reuters, Roof's defense attorney, David Bruck, told the court at the July 31 arraignment for his federal charges: "Roof has told us he wishes to plead guilty. Until we know whether the government will seek the death penalty, we cannot advise Mr. Roof." The federal judge for Roof's 33 federal hate crime and firearm charges entered a temporary "not guilty" plea for Roof. It's still not clear whether Roof's federal or state trial will happen first. South Carolina Governor Nikki Haley called for Roof to be sentenced to death two days after the shooting. "We will absolutely want him to have the death penalty," Haley said referring to Roof on Today. At Roof's first court appearance June 19, victims' relatives told him they forgave him and were praying for him. Nadine Collier, the daughter of Ethel Lance, who died in the shooting, told Roof: "I forgive you. You took something very precious from me. I will never talk to her again. I will never, ever hold her again. But I forgive you. And have mercy on your soul." However, Wilson doesn't believe that forgiveness should replace a punishment, which is why she's seeking a death sentence. She said at a news conference Thursday: "We all agree that forgiveness can be an important part of the healing process, but know that forgiveness does not necessarily mean foregoing consequences, even severe consequences."